Madison Seating | Aeron™ Looking Good in Wood! Aeron™ Looking Good in Wood! By now you should all be familiar with my Aeron™ Chair obsession, and I will ask that you indulge me once more as I reflect today, on a slightly woodier version of the worlds most coveted office chair. 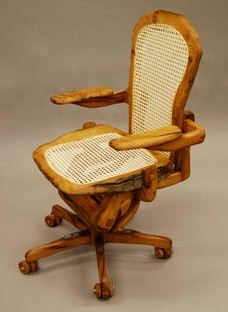 Just when you thought the perfect office chair model could not possibly be improved upon, along comes a design student at UW-Madison, (which is actually the alma mater of Mr Bill Stumpf, co-creator of the Aeron™) and, using reclaimed barn wood, produces a wooden version of the classic office masterpiece. Obviously, it all comes down to the wood. I am not quiet sure what it is, but there is something about wood, that can take a product to the next level. Whether it’s tables, desks, even that fake wood trim you see in the “Limited” version of certain cars. There is something about a wooden trim or all-wood product that will give it an air of sophistication and a certain sense of distinguished class. Take the Aeron™, for example. An item that, as executive chairs go, represents the very latest in design and quality manufacturing. Sleek, modernistic and classy even in its classic design, when cast in wood, it becomes venerable and distinguished (although I will grant that it may not be as functional…). However, before Herman Miller gets any ideas, I would caution that sometimes, a thing can simply be too much. Like pizza and ice cream or dill pickles dipped in chocolate, certain things, though perfectly great on their own, simply do not go together. I feel like the Aeron™ was meant to be sleek, stylish and futuristic as portrayed by it’s original design. Adding the wood, while classing it up, also links it to stereotypes of the old rigid back-killer chairs that the designers of the Aeron™ worked to hard to break. Top 5 Reasons to Buy an Aeron. Furniture Design: Grow Your Own Furniture, Israeli Style!